Japonica is a bi-annual event centered around Japanese culture. Japonica’s summer round opened on June 30th and the homely market offers a variety of Japanese products, handcrafted by talented and unique creators. I am displaying the BOILDEGG “Yuri” gacha set. The set consists out of various floral home and garden items, all of which can be won in different color sets. Furthermore, I am wearing a gorgeous dress by Lomomo. I particularly love the florals and matching of different patterns. 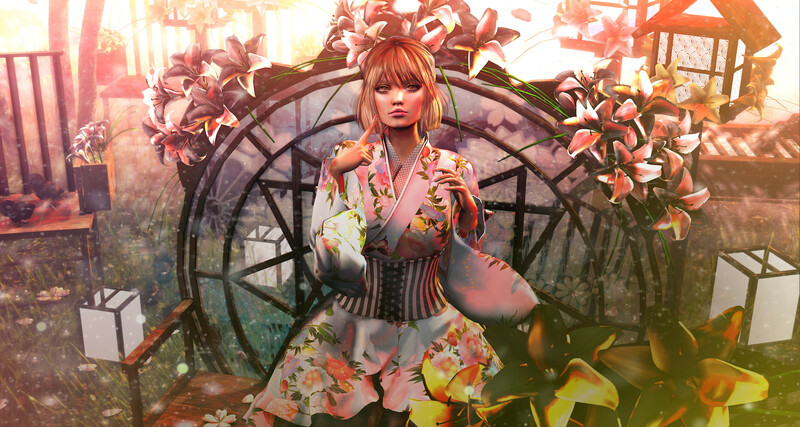 Grab a slurl to Japonica here and drop by before the event closes on July 22nd. After you’ve visited Japonica, make sure to also pay a visit to Summerfest ’18 if you haven’t yet. I have previously blogged imbue’s gorgeous exclusive for the summery event and today I am displaying two other Summerfest releases. Firstly, I am wearing the playful “Pancake” hair by Navy and Copper. This short hairdo is incredibly adorable and a great addition for any beach babe’s inventory. Secondly, I am using the “Riley” Catwa applier by Belleza with the complimentary makeup set, which was also released at this year’s Summerfest. I have made a vlog that fully displays this applier and the additional makeup set. Watch the “Belleza Riley Catwa Applier” vlog on YouTube now!